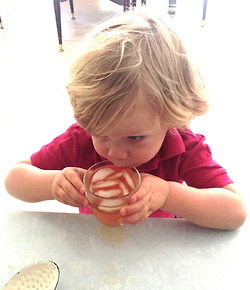 Teddy always wants a sip of my coffee or tea, so I concocted a decaffeinated kid friendly treat that makes him feel so grown up! Brew tea, add sweetener and bring to room temp. Add peaches, lemon juice and serve in big boy cups.